Just like the popular opinion that movies are never as good as the books they're bringing to life, another movie-goer truism is that sequels never manages to surpass the first title in a series. Yet, even though there are always exceptions to the rules, what makes the latter adage that much more intriguing with regard to Disney's adorable The Search for Santa Paws is that, although it's releasing a year after 2009's Santa Buddies: The Legend of Santa Paws and is in fact a prequel to Buddies it still follows the logic that a sequel is weaker than the first title. For not only is this introductory film in the Santa Paws spin-off of the Buddies franchise light-years better than last year's Legend of Santa Paws but it's also the best live action direct-to-disc Buddies related feature that Walt Disney Home Entertainment has ever released. On par with Disney's original, surprisingly high quality heartwarming charmer Air Bud instead of the profitable, repetitive and creativity challenged Bud and Buddies sequels that would follow its four-legged paw-steps, The Search for Santa Paws likewise triumphs because it has much more in common with vintage Disney works that emphasize a great story first and foremost. Additionally and fitting to the season, screenwriters Robert Vince and Anna McRoberts infuse the work with a healthy dose of Christmas spirit and all that entails such as celebrating your imagination, believing in miracles (especially ones that you make happen yourself) and offering love, support, kindness and compassion to those in need. 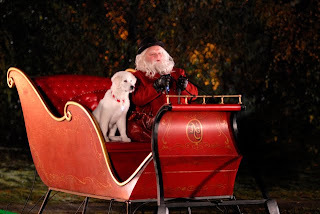 To this end, Santa Paws manages to succeed where previous Buddies films did not. Obviously Search benefits from not even including the relatively obnoxious Buddies at all because it is a prequel to their first meeting. 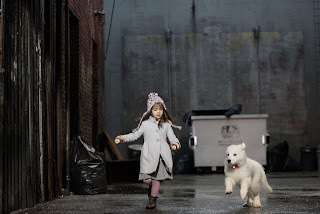 However, the writers behind Paws realized that to be far more effective in endearing their characters' plight to the audience, the human storyline has to be so compelling that even without the cute canines, we would still want to watch the film and they've achieved this superbly. 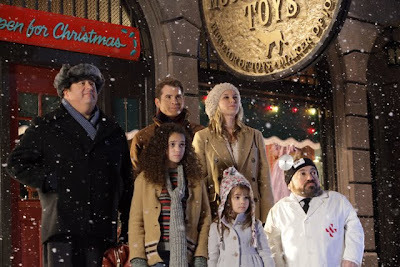 Part A Little Princess , Miracle on 34th Street and part Annie , Search incorporates three initially separate complex plots that eventually overlap in a multitude of ways, featuring a variety of supporting characters that help sew the trio of threads together to form an irresistible holiday tapestry. Not skimping on the technical aspects in the slightest, this gorgeously festive, sparkling feature work rivals Disney’s theatrical releases in terms of stunning clarity, excellent production values and seamless visual effects. Debuting on disc with the benefit of a money-saving combo pack that boasts the movie in two different formats – DVD and Blu-ray – so you won’t have to buy it twice, Search maintains the Disney tradition of filling their family friendly titles with fun games, a sing-along mode and bonus features to further engage your children. 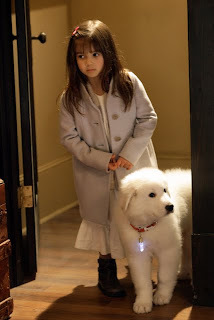 Hoping to ease Santa’s suffering over the loss of his friend, the formerly jolly man’s head elf Eli (Danny Woodburn) uses a magical icicle to bring Paws to life with the added bonus that he’s able to converse with those who believe in the pup’s best friend and owner, Santa. Unfortunately, after a sudden traffic accident separates the dog from his master and leaves Santa (Richard Riehle) with acute memory loss once they touch down in New York, Paws embarks on a journey reminiscent of Disney’s animated ‘80s hit Oliver and Company to track down Santa in time for Christmas. Meanwhile, drawn to the faintly familiar sign for Hucklebuckle’s Toy Shop that used to belong to his old friend, Santa wanders inside to become (what else?) the store’s holiday Santa. Particularly contented to surround herself with the smiling children she hasn’t yet managed to have, the compassionate, people-person Kate takes to running the store like a fish to water. However, her business minded accountant husband is mainly eager to follow the demands of his grandfather’s will to run the shop and turn a profit for one successful holiday season before he’ll then have the deed in hand, allowing him to decide whether or not he’d prefer to sell Hucklebuckle’s Toys and return to L.A. or keep the family legacy alive. 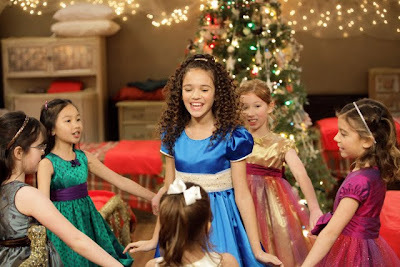 In easily the most heartwarming subplot that draws the most focus and engages Disney’s target family demographic, we encounter the timid yet loving young orphan girl Quinn (Kaitlyn Maher) who, having lost both of her parents, is handed over from Social Services to the well-manicured but evil clutches of the selfish Ms. Stout (Wendi McLendon-Covey). A diabolical two-faced creature straight out of Disney animated villainy a la 101 Dalmatians ’ Cruella deVil, Ms. Stout uses the girls in her home to do her chores and keep her in luxury wear, investing the checks that should be funding their education, food etc. in couture, salon services and jewelry. 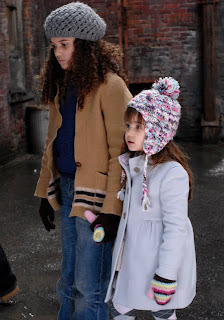 Leaving the eldest orphan, Willamina (The Game Plan cutie Madison Pettis) to look after the rest and keep them in line, Quinn and Will become fast friends, sneaking off to admire the toys in the store window at Hucklebuckle’s Shop before the spunky, Christmas believer Quinn surprises Will by courageously wandering inside. Thus, it’s only a matter of time before the characters in director Robert Vince’s jam-packed ninety-six minute film gradually intersect with entertaining results including misunderstandings, near-misses and happy coincidences over the course of an unforgettable holiday season where the spirit of Christmas manages to touch even those who felt they no longer believed. Admittedly with three storylines all competing for attention, at times, the screenwriters are forced to resolve so many conflicts through rushed subplots or at the expense of shortchanged supporting characters that serve as mere connective devices to link together the right events or people so it all clicks into place. 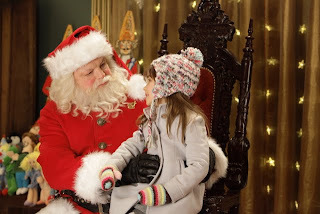 Yet The Search for Santa Paws is overall so touching, earnest and downright lovable that you’ll easily forgive the work of its occasionally perfunctory wrap-ups as well as its comfort food like predictability. Admirably, the scribes take some big chances, incorporating darker elements involving health scares for two main characters and not shying away from emotional intensity particularly with the plight of the orphan girls constant push and pull with Ms. Stout. Therefore, when the inevitable Disney happy ending finally comes to fruition, because we’ve watched these New Yorkers and North Polers – both human and canine alike – overcome so many struggles, the final smiles feel fully earned for those onscreen in addition to the viewers at home who may be surprised by how moved they are by this particular Search.